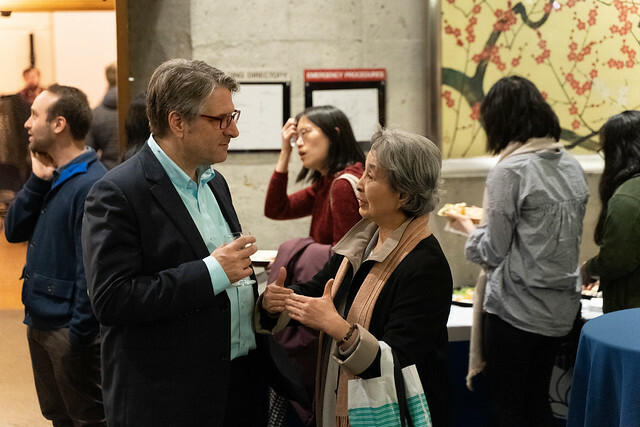 This year’s annual John Howes Lecture in Japanese Studies, on November 22nd 2018, featured guest speaker Dr. Emiko Ohnuki-Tierney, and her talk, “The Social and Political Lives of Japanese Cherry Blossoms.” Her lecture focused on the history of the cherry blossom in Japan, and the ways that the image has been used and even abused, especially during WWII. Dr. Ohnuki-Tierney addressed the often overlooked stories of young Kamikaze pilots, many of whom experienced heavy punishments and coercion in building “loyalty” to the country, which the cherry blossom came to symbolize at the time. The seats in the Asian Centre auditorium were packed in anticipation for the lecture, with roughly 200 people in attendance. Community members, alumni, faculty, staff, and students attended the lecture, followed by a reception where participants could enjoy not only food and wine, but also the meaningful conversations that the John Howes Lecture so often fosters.We’d like to thank Dr. Ohnuki-Tierney for her valuable insights, those who made the event possible, and of course all participants who shared the evening with us. We are honoured that gifts continue to be made to the lecture’s endowment fund, allowing it to support prominent speakers and rising costs. Additional gifts can be made to the lecture at https://support.ubc.ca/howes-lecture.